Residents of a historic neighborhood in Belfast are up in arms after a trio of young Waldo County property developers put forward a plan to turn the former Peirce School building into rental apartments. The century-old brick elementary school most recently served as a medical marijuana growhouse after it was bought at auction in 2013, a use that apparently did not bother its neighbors. But the proposal by Stockton Springs-based Reservoir Ventures assuredly has. Many of those opposed wrote letters sharing their views and spoke out during two recent Belfast Planning Board meetings and Tuesday night’s regular Belfast City Council meeting. The council would need to amend a city ordinance for the property to be developed in this way. Councilor Mike Hurley said at the meeting that he believes the fears of the neighbors are overstated. Christopher Hyk, who lives on Church Street, said that he is concerned that the rezoning of the 7,500 square-foot property at 24 Church St. will lead to more noise, more traffic and more problems in the neighborhood he and his wife moved to 24 years ago. But developers disagree that their plan for the Peirce School would bring Church Street down. Jessie Francis, who is part of the group along with her husband, Matt Francis, and their friend, Tyler Eads, said as much to the Belfast Planning Board at its regular meeting Dec. 12. The trio has other real estate ventures in Stockton Springs, Belfast, Searsport and Naples. The plan for the school would leave the exterior and grounds of the building intact, while converting the interior into eight one- and two-bedroom “stylish, energy-efficient, and safe” apartments, according to the 60-page project proposal submitted to the planning board. The 1915 building, which has two stories and a full, daylight basement, was in use as a school until 2003, and in fact the daily traffic will be reduced from historic levels, the proposal states. A sample lease that is included in the proposal shows rent of $1,500 per month, a sum that would include all utilities. The group from Reservoir Ventures needs to get approval from city officials because of the building’s particular zoning. In 2014, the Belfast City Council and Planning Board amended its district in order to increase the potential uses of buildings there, Belfast City Planner Wayne Marshall said last week. 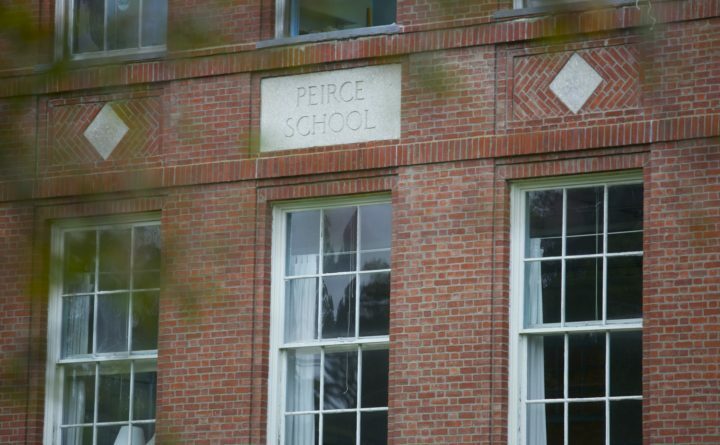 At that time, the Peirce School was deemed acceptable for multifamily housing only if it was a condominium form of ownership — not rental property. But the past four years have only seen the city’s housing problems increase. “The council and planning board have both identified that Belfast is experiencing pretty much a rental housing crisis and are trying to increase the amount of rental housing in town,” Marshall said. On Tuesday night, the Belfast City Council had its first reading on proposed amendments to rezone the Peirce School property and two others. During a public hearing, it heard from some distressed neighbors, including Hyk, who asked them to slow down the decision making and to consider their point of view. They also read several letters from opponents, some of whom expressed fears that the Peirce School would become a “sober house,” or be turned into AirBNB rentals. The proposal from Reservoir Ventures did not mention anything about sober houses or AirBNB. However, Belfast City councilors were largely very enthusiastic about the proposal when they discussed it, and voted unanimously to pass it through to a second reading Jan. 15. During the discussion, councilor Neal Harkness, who rents an apartment in town, said he did not appreciate some of the negative characterizations of renters he heard from opponents. “Being a renter doesn’t make me more prone to being a criminal. Just putting that out there,” he said.